Endoscopic detection and analysis has set the stage for endoscopic cure of early cancers of the gastrointestinal tract. Endoscopic submucosal dissection (ESD) introduced the principle of oncosurgical en-bloc resection to mucosal neoplasms, providing histological grading, pT staging, and resection R status. ESD aims for curative resection of mucosal cancer. The risk of local recurrence—in the range of 10–35% with snare ablation in piecemeal fashion—is reduced close to zero after curative ESD. 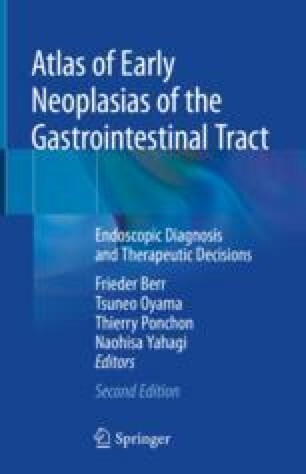 Accurate endoscopic analysis of early neoplasias is necessary to decide the differential indication for snare resection, ESD, or surgical resection. ESD is now spreading in Western countries, but requires a twofold learning curve: endo-diagnostic for correct indications and endo-electrosurgical for curative tumor resection.